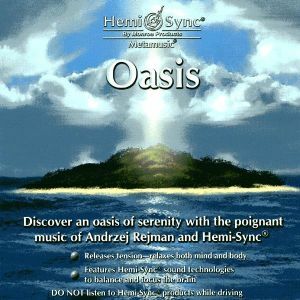 Discover an oasis of serenity with the poignant music of Polish composer Andrzej Rejman and Hemi-Sync®. Known for his international flavor and feel, Rejman blends a Central European romantic style with some neoclassical moods in this uplifting composition. Inspired by the beauty and mystery of nature, this timeless arrangement will provide safe harbor from your daily concerns. Oasis is also ideal for stimulating creativity and imagination. Instruments featured: keyboards, piano, synthesizer, strings arrangement, folk bells, electric and acoustic guitar. Problem solving and Creativity, Imagination, Relaxation music.